Down Satellite supply and install all types and all sizes of televisions, both LCD and Plasma. We can supply major brands including Panasonic and Sony at competitive prices. We can also advise you on which piece of equipment most suits your needs and lives up to your expectations. Let us help you take the hassle and worry out of buying equipment, at prices more competitive than any of the high street dealers. Why pay more for the big premises, staff and large overheads? We will assist you one on one, in the comfort of your own home. 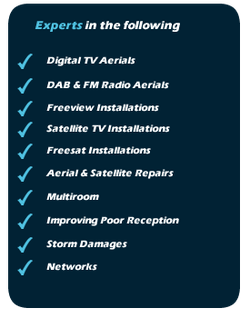 Contact us today for latest offers and prices including a FREE non obligation quotation.